Taken by Duffy during the second of Five Sessions with David Bowie – Duffy’s most famous photograph dates from the 1973 and is the iconic and revolutionary cover of David Bowie’s album – Aladdin Sane. 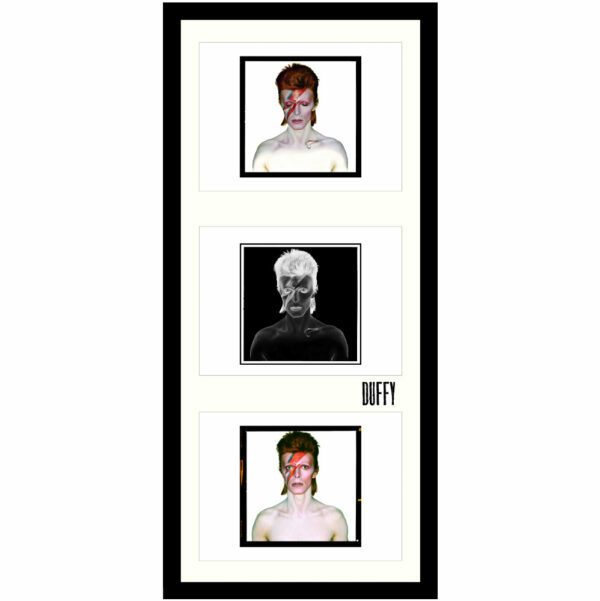 A shot that became the defining look of Bowie’s long career, and has been referred to as the “Mona Lisa of pop.” Presented in a ready to mount frame embossed with the Duffy archive stamp. The defining image of Duffy and Bowie’s creative relationship which has become synonymous with the legacy of both artists. Tony Defries commissioned Duffy Design Concepts to create the entire Aladdin Sane album. The brief was simple – “Can you make it expensive?” The intention was to take Bowie to an international level. Also to make a bill so large that the record label would have to pay attention. A Dye-transfer image was the answer. A process which was notoriously costly, with the production taking place in Switzerland. Duffy carved the iconic red and blue “Flash” across David’s face in lipstick. The outline was then filled in by makeup artist Pierre Laroche. The image was then sent to airbrush artist Philip Castle. Duffy previously worked on the 1973 Pirelli Calendar with Castle who applied the water symbol on Bowie’s chest. In 2010 the Aladdin Sane black and white negative remaster was created by Chris Duffy. This was to coincide with the opening of a Duffy Bowie exhibition in Beverly Hills, California at Stephen Webster Gallery. The image was in such high demand that it was made accessible in an open edition. During the same session in 1973, Duffy shot Bowie in the exact same position with his eyes open, revealing his old school injury. David’s permanently dilated left eye – one of his most recognisable features – gifted to him by lifelong friend George Underwood in 1962 during a fight over a girl. This “Eyes Open” image was discovered by The Duffy Archive over 30 years later and unveiled for use in the record-breaking V&A exhibition becoming as iconic as the classic album cover in the process. The show titled David Bowie IS has Toured around the world to Canada, Brazil, Germany, USA, France, Australia, The Netherlands, Japan, Italy, Spain, and America.